Chicago Lucy Flower Vocational H.S. "Foxes"
Chicago (population: 2.8 million) is the nation's third largest city that grew quickly within its first 100 years. From it's founding in 1803 and even still today, the city possesses an eclectic feel with its numerous cultures and history that distinguishes the community from others world-wide. Even after a great fire in 1871, Chicago pulled itself up by its bootstraps and rebuilt itself, then annexed other smaller communities such as Hyde Park, Englewood, Lake, and many others. "History of Lucy Flower High School"
"In 1911 Lucy Flower Technical High School opened as Chicago's first open-enrollment school for girls. It was named after a leading education activist of the late 1800s, Lucy Louisa Flower, who was also the co-founder of the Illinois School for Nursing. Ella Flag Young. a supporter of Miss Flower's educational philosophy, was Chicago's first woman General Superintendent of Schools from 1909 - 1915. The school was headed for twenty-two years by the city's first woman high school principal, Dora Wells. Flagg organized the all-girls school to help young women gain specific skills to help them enter the work force, just like boys were being trained to do at Crane Tech & Lane Tech. Students could enroll a four-year home economics course which included college preparatory work, while there was also a two-year course for vocational studies such as sewing, dressmaking, and millnery that were close to skills that were displayed by females during the early part of the 20th Century. Initially, the school was located on the south side of Chicago in the former South Division High School building at the corner of 26th Street and Wabash Avenue, offering skill development in the areas of sewing, teaching, nursing, and social work. 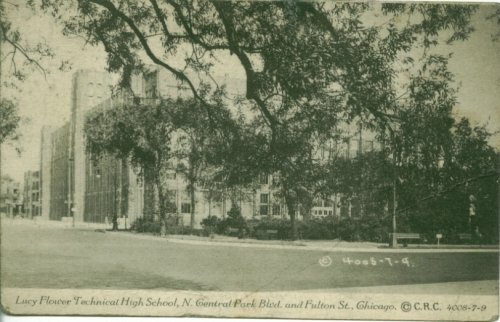 In 1927, the school was relocated to the East Garfield Park Community. Flower had become known for providing good education to women. After the school relocated to 3545 W. Fulton Avenue on the city's West Side, African-American enrollment first declined. However, the school continued to attract girls from the South Side of Chicago due to its open enrollment policy. Flower remained a technical school until 1956, at which time it was renamed Flower Vocational High School. The school then offered programs in Business Education, Commercial Art, Home Economics, Beauty Culture, and Cosmetology. Legal mandates in the 1970s required the school to become coeducational. With a co-ed population the school continued to teach vocational skills to both young men and young women. Student run businesses developed. These were the Flower Pot Cafe', the Flower Cart, a Credit Union, and Megabytes, which was a computer-generated design graphics business. The school was renamed Lucy Flower Career Academy High School in 1995. In 1999 the last freshman class entered the high school. Flower was closed in 2003, after the last class graduated." There is good news about the building...it is still used as a high school for Al Raby School for Community and Environment. Athletic team nickname: the "Foxes"
We could not locate evidence that Lucy Flower High School offered athletics on the IHSA website. It is quite possible, even likely, that the school did offer a sports program. If you have this information, please forward it to us for inclusion on this page. "There was a basketball team there, "The Flower Foxes" of course! I went there in 1978. The school colors where brown and gold." "My mother attended Flower Tech and graduated from the four year technical program in 1936 (Catharine L Milano nee Holland). I believe she graduated in the February class. She told me the school fight song was called "Flower Tech" and was sung to the melody of "On Wisconsin." The School song, presumably the equivalent of the Alma Mater, was "I love You Fair Flower." I recall her saying that the girls had to stay on one side of the stairways to go up and the other to go down, a rule that was strictly enforced. The technical students took a regular academic load and also subjects including tailoring, pattern-making, quantity cooking and the like. There was a fair distinction between the technical and vocational girls, I guess, although many from across both programs suffered the economic issues of the depression era." "When I attended Lucy Flowers High School, the principal of the then all-girls school was Sophia Thailguard. The Garfield Park Conservatory across the street allowed us to use its tennis courts for school credit. Two students shared a locker, each furnishing her own lock. Good students would be sent as couriers to deliver communications between teachers. THe stairs were designated for one direction travel only for traffic flow. Sometimes we called the school "Juicy Flower" because of Juicy Fruit chewing gum. Women would leave children for child care experience for the students, even paying students to prepare a a dinner for their charges. Students would come in from boys schools for school dances too." "My name at the time was Karen F Thoma, my sister- Mary Jean Thoma attended what we called "Lucy Flower" I would have graduated with the class of 1960; but, our family moved to Columbus,Oh in Nov. 1959. I have many fond memories of teachers and friends there. Even though the school was in a disadvantaged area it was OUR school and were proud to be there. My best friend was Gladys Williams ( I would love to make contact with her if you could assist me.) My favorite teachers were Mrs. Lussenhop who was the home ec. instructor and Mr Folkers . I believed that he taught social studies." "I attended Lucy Flower from 1968-1972. I credit the educational guidance that I received there as a platform to gainful employment. I was part of the work study program in my senior year and was employed at Chicago Title and Trust. My teachers were competent and professional: Mrs. Stephenson, I still am adept at shorthand and 'correct' typing thanks to your masterful instruction; I thank you. My English teacher, Mrs. Novak exposed us to the world of the classics: I remember "Great Expectations" and "The Lady or The Tiger: I thank you for your support in introducing me to excellence in literature."